The Edinburgh Branch is a small and friendly branch with a very active membership. We take part in many varied activities both mounted and dismounted. All members are encouraged and given the opportunity to participate in team events. Our emphasis is making learning with your pony FUN! Full day rallies are held once a month in a variety of locations throughout the Edinburgh and Lothians. Rallies typically include a flatwork lesson and dismounted work towards PC badges and then either a showjumping, xc or working hunter lesson or similar. In addition special clinics for smaller groups are organised in a variety of different fields. See our Newsflash page for the latest news! 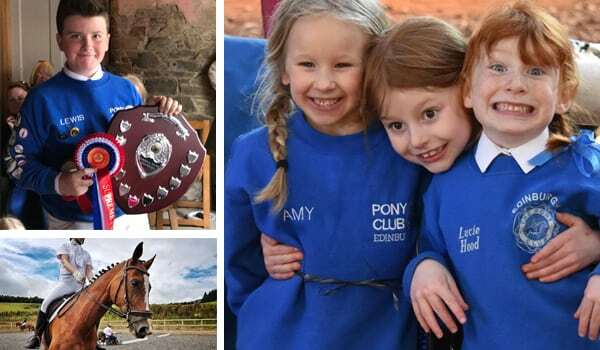 Rallies and Activities page contains our branch rallies as well as pony club competitions and non-pony club competitions which may be of interest. It is worth checking regularly and if you hear about an event of interest to other members then email: edinburgh@pcuk.org and we will add it to the calendar. Please remember to always use Easy Fundraising! See our page and help raise vital funds. As a member of the Pony Club you can get discounts for major equine events. The Edinburgh is a Branch or Area of The Pony Club.